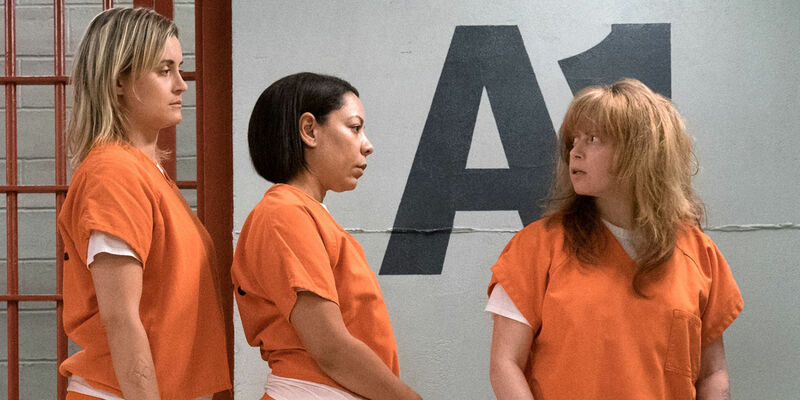 After the intense prison riots that overtook Litchfield Penitentiary for the entirety of Season 5, Season 6 promises a change of scenery and social climate, which means some new faces. One of those new faces is an inmate named Barb, who is in maximum security, along with her sister, Carol. They’re not friends though. 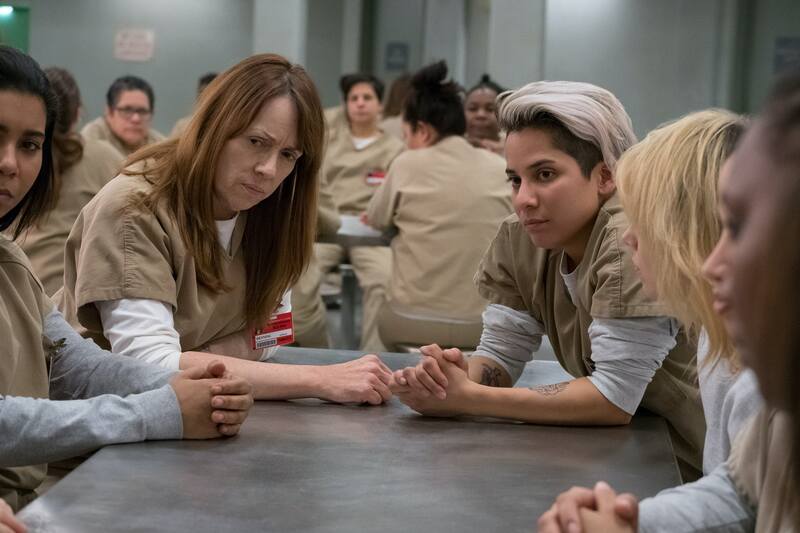 In fact, the two of them head up the show’s newest gang rivalry and her erratic character will be dominating the screen for much of the new season, so you might be wondering, who plays Barb in Orange Is The New Black? As you make your way through the Season 6 marathon and watch Barb interact with the other inmates, you may start to scratch your head out of faint recognition of the actress who portrays her. Well, if you’re a nineties kid who watched the Disney Channel growing up, you may recall the long-gone show she starred in. Per her IMDb profile, a younger Mackenzie Phillips, who now plays Barb in OITNB, portrayed rocker mom Molly Phillips in the paranormally charged show of the late ’90s called So Weird. Light bulb, right? Well, if you don’t recognize her from ’90s Disney Channel commercials, you may have heard her name pop up in more controversial news. In 2009, Phillips released a memoir titled High on Arrival. She promoted the book on The Oprah Winfrey Show, where she revealed the darkest secret that lived within its pages. As per CNN, she was part of a decade long consensual, sexual relationship with her now-late father, musician John Phillips who reportedly sexually assaulted her on the eve of her wedding when she was 19 years old, according to People. “It was the Stockholm syndrome where you begin to love your captor,” she told Winfrey, according to a CNN report. “I felt love for my father, but the moment he tried to make it a romance, I was shot into the present time.” It wasn’t until she became pregnant, and was unsure of who the father was, that she put an end to their sexual relationship. In maximum security on Season 6 of OITNB, Phillips’ character, Barb, is a drug addict and self-proclaimed leader of cell block D. She rallies her bunkmates against the block of her also imprisoned sister, Carol, who is locked up for the fictional murder they committed together. Like her character, Phillips also once struggled with substance abuse. She’d dabbled in drugs since her teen years, when her dad first shot her up with cocaine, per CNN. According to a Reuters report, in 2008, she pled guilty to cocaine possession and was sentenced to a drug rehabilitation program. Her addiction played a huge role in her life, leaving her fired from one of her biggest acting gigs, per People, on the classic sit-com One Day At A Time, after multiple instances of appearing incoherent on set. In true OITNB fashion, Season 6 is complete with flashbacks from younger versions of the imprisoned women, including a young Barb, who is played by Lauren Kelston. Per her IMDb profile, Kelston is known for her roles in Last Night in Brooklyn and Four Corners Road. Both actresses are very excited to join the Netflix original’s cast for the new season. To find out the rest of Barb’s story and how she ended up in a rigidly segregated, drug-fueled prison rivalry against her own sister, you’ll just have to press play on Season 6.